Ray Henney is a litigation attorney with extensive experience in litigating a wide variety of securities cases in various state and federal courts and arbitration tribunals in numerous states. He possesses substantial experience representing corporations, individuals, and brokerage and investment advisor firms in SEC, federal, and state investigations and enforcement actions. 2017 – "[Ray] is noted for representing clients in securities litigation, as well as shareholder disputes and product liability cases. One client enthuses that he is 'extremely diligent,' while another views him as 'a very skilled litigator and a good negotiator in terms of mediating resolutions.'" 2016 – "[Ray] is an experienced litigator and arbitrator who has appeared before courts and tribunals across the US. 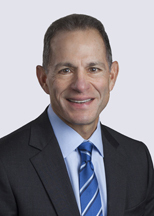 He is particularly known for his expertise in securities law, product liability claims and shareholder disagreements." 2015 – “[Ray] specializes in securities litigation, with experience in both trials and arbitrations. His clients include investment and brokerage advisories." 2012 – "[Ray] is well respected for his class action and securities expertise."